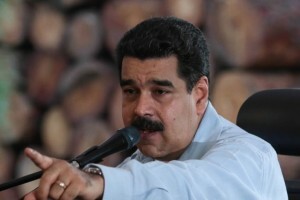 CARACAS - Venezuelan President Nicolas Maduro’s approval rating rose to 23 percent in September, up 6 percentage points from 17 percent in July, according to a poll by local firm Datanalisis. The rebound followed several rounds of sanctions by U.S. President Donald Trump’s administration as well as a sharp drop-off in four months of violent anti-government protests. Nearly 52 percent of respondents opposed the Trump administration sanctions that came in response to the creation of a legislative superbody called the Constituent Assembly, which critics call the consolidation of a dictatorship. Fifty-seven percent said they disagreed with the United States using a “military option” to push for change in Venezuela, in reference to Trump comments in August that were met with condemnation around the region. Maduro’s low approval is not unusual in Latin America. Presidents Juan Manuel Santos in Colombia and Michel Temer in Brazil have shown lower poll numbers this year. But Maduro’s popularity has been falling since he was narrowly elected in 2013 following the death of late socialist leader Hugo Chavez. The decline has largely resulted from an economic crisis driven by triple-digit inflation and Soviet-style shortages. The opposition says the crisis is the result of a failing socialist model and rampant corruption. Maduro blames the situation on an “economic war” by the opposition with the support of Washington. The poll, which surveyed 1,000 people between Sept. 8 and Sept. 22, showed that 86.9 percent of respondents believed the country’s situation was negative. The survey’s margin of error was 3.04 percentage points.